This St Patricks Day make a Pot of Gold filled with yummy treats. So easy to make, to give or keep! These also work great as party favors! 1. Paint your paper cups black. Or, if you have black cups already you're one step ahead! 2. Once the paint is dry, poke holes on either side of the paper cup with a pencil. Thread one end of the pipe cleaner through the hole, fold up, and twist to make the handle. Thread the pipe cleaner through the other hole and repeat. 3. We glued on some green shamrocks made from construction paper and filled them with treats. We have yellow gum drops in one and Lucky Charms cereal in another (a little bit healthier option). Find any yellow candy you can to fill your pots. 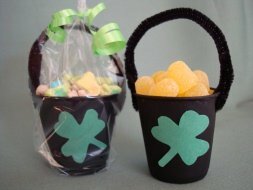 If you want to give these as favors you can leave them as is, or you can wrap them in a baggie and tie a green ribbon around the top. Just remember that paper cups generally have a waxy finish on them, so they may take two coats of black paint to cover them. What works really great for this craft is those small paper bathroom cups; they're just the right size and they don't have the waxy finish so they paint easily.